A versatile fully balanced ration designed to suit pigs of all ages and stages of development. With quality protein sources and digestible cereal energy, to support pregnancy and lactation as well as steady lean growth and development in weaners and finishers. Fully balanced with vitamins and minerals, including important antioxidants, like vitamin E, bioavailable Sel-Plex® selenium and zinc. Contain Bio-Mos®, a prebiotic to support gut health and digestive efficiency. 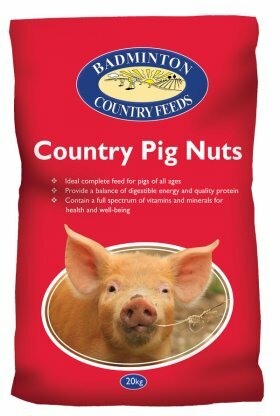 Country Pig Nuts can be introduced to weaned piglets from 8 to 10 weeks of age. Feed Country Pig Nuts to weaners ad lib until they reach 25kg bodyweight, then feed 1 - 1.5kg of per day, rising by 0.5kg per day for each further month of age, to a maximum of 2.5kg per day for a bacon weight pig (85 – 90kg). Dry or pregnant sows, adult pigs and working boars may be fed from 2kg to 4kg per day, depending on breed and condition. Wheatfeed, Wheat, Distillers Grains, Soya Bean Extract, Molasses, Calcium Carbonate, Soya Oil, Sodium Chloride, Vitamins & Minerals, Dicalcium Phosphate.